An instructional drumming video from pop/Gospel/R&B/rock drumming sensation George ìSpankyî McCurdy (drummer for Lady Gaga, Diddy, Kanye West, Jill Scott, Justin Timberlake, and Timbaland). Spankyís playing has long been admired by awestruck drumming fans, and now he divulges his secrets on this new video! 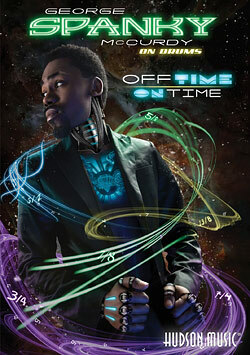 Off Time/On Time explains and demonstrates a wealth of concepts, licks, and secrets to taking your playing to an entirely new level. One of the main topics covered on the DVD is the ability to play creative grooves and fills that are extremely creative and can sound ìoff time.î Spanky performs many examples, from basic to very advanced, where he shows you his concepts and secrets to ìoff timeî playing. Examples are performed at different metronome settings, and other approaches are explained, including taking an idea on one surface and moving it around kit. All of these examples are applicable to R&B, pop, rock, and gospel playing situations. Also covered are creative concepts to spice up your drumming tool kit, including cool ideas of Spankyís own creation such as ìpartial diddles,î ìthe echo,î ìthe CD skip,î and being able to play over-the-bar-line fills. There is also an extensive section on hand and foot techniques and tricks, including foot doubles, before-and-after effects with the hi-hat, ìsneak attackî bass drum technique, playing off time with the ride cymbal, hi-hat/snare combinations, and much more. All of the concepts presented on the video are then demonstrated by Spanky as he plays along to several funky, melodic tracks of his own composition.